Millions of people from Australia to Ethiopia are facing water shortages, failed harvests, and food insecurity. 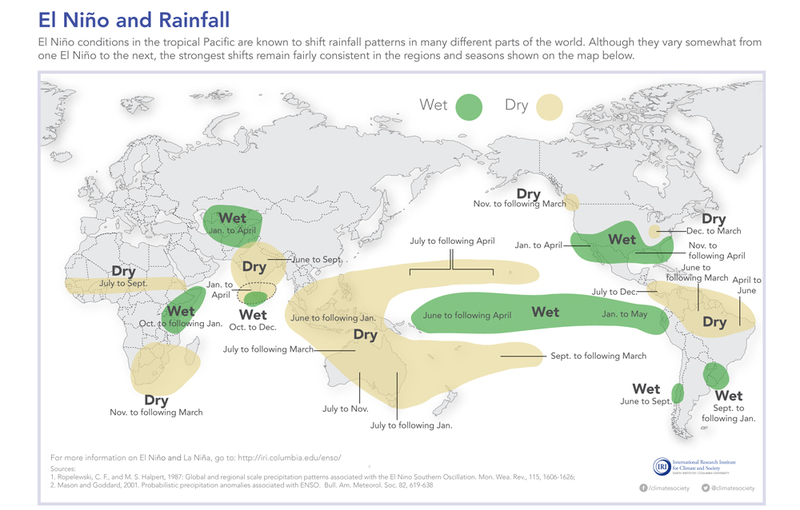 El Nino weather events disrupt rainfall patterns around the world. In general, Asia and Australia become drier during El Nino while North America becomes wetter.Click image to enlarge. Forecasters at NASA’s Jet Propulsion Laboratory warned in August that unusually warm water in the equatorial Pacific Ocean was brewing a “Godzilla” El Nino, a supercharged version of the global weather phenomenon that yanks rainfall and temperature patterns from one extreme to the next. Three months later, the monster is showing its teeth. Water shortages, food insecurity, and diseases related to El Nino weather patterns threaten more than four million people in the Pacific region, officials with the United Nations Office for the Coordination of Humanitarian Affairs (OCHA) told the Guardian in October. The United Nations also linked El Nino to droughts and increasingly critical food insecurity in sub-Sharan Africa. Meanwhile, the Middle East is bracing for a rare cyclone that is expected to bring heavy rainfall and storm surge to the Arabian Peninsula. El Nino forms when warm water in the Pacific Ocean changes major air circulation patterns, disrupting weather globally. Southeast Asia and Australia generally experience drier and hotter weather, and North America receives more rainfall. The last El Nino occurred in 2009, though its effects were relatively weak compared to the 1997 El Nino. The 2015 El Nino appears to be living up to its hype—particularly in the Pacific—and is expected to remain strong through the end of the year. The damage, according to NASA forecasters, could surpass even the deadly 1997 El Nino that cost the world $US 34 billion. Food shortages are already acute in Papua New Guinea, where the worst drought in nearly two decades and frosts in the country’s highlands destroyed critical harvests. Local communities have reported both adults and children dying of starvation, according to the Sydney Morning Herald. The drought also forced several of the country’s gold and copper mines, including the OK Tedi copper mine, to temporarily suspend operations. Images of sea surface height anomalies in the Pacific, which are used to detect El Nino weather events, compare the progression of the 1997 El Nino and the 2015 El Nino. Click image to enlarge. Dry, hot weather is also afflicting areas of neighboring Australia. Drought conditions and heatwaves in Victoria and New South Wales could cause nearly $US 358 million in damage to the country’s wheat crop, according to forecasters, and dairy and livestock farmers are culling their herds as pastures dry up. International investment bank Goldman Sachs has cited concerns that its forecast for Australia’s 2016 gross domestic product could be “understating the risk from an intensifying drought in key parts of Australia,” Australia Financial Review reported. The country is also preparing for what could be a severe fire season, with echoes of the massive blazes in Indonesia that are creating smog over Southeast Asia. Across the Indian Ocean, Ethiopia is in the grips of its worst drought in 30 years, according to OCHA. The UN agency warned that humanitarian needs in the country have exceeded levels experienced during the 2011 Horn of Africa drought, which contributed to a famine that killed 260,000 people in Ethiopia, Kenya, Djibouti, and Somalia. This year, El Nino weakened summer rains that are essential for Ethiopia’s food security, a bulletin released by OCHA on October 26 said. El Nino is also expected to keep dry weather firmly in place over South Africa until next year, Reuters reported. The country’s water supplies are already running low due to a severe drought and high temperatures, prompting water rationing for sprinklers and hoses in Ekurhuleni, Johannesburg, and Pretoria, according to Bloomberg. In California, optimists are hopeful that El Nino rains will help refill reservoirs depleted by four years of drought. In the latest three-month forecast from the International Research Institute at Columbia University, however, the state straddles the border between normal and above-normal precipitation.